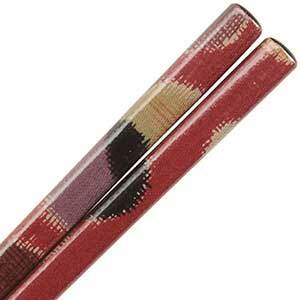 Kyo Nishijin Japanese chopsticks are wrapped with Kyoto Yuzen fabric and then sealed with a clear food safe lacquer. Kyoto Nishijin is yarn-dyed woven fabric from Nishijin, located in the north-east area of Kyoto. The fabrics produced there have been a part of Kyoto's history since the Heian period (794-1185) and have been recognized by the design houses of Lyon, France and Milan, Italy. Nishijin differs from yuzen in its being more elaborate and ornate, often containing gold threads woven into the design. To learn more online about Kyoto Yuzen chopsticks check out our page Japanese Chopstick Craft | All About Nishijin Ori Chopsticks. 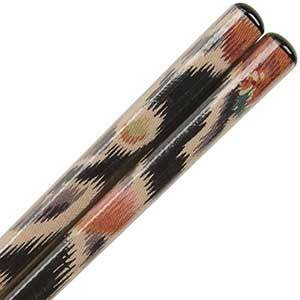 Autumn on Black Kyo Yuzen fabric chopsticks, 1 pair. The fabric used in this chopstick is from the Kyoto region of Saga. 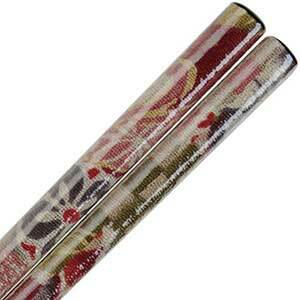 These chopsticks are wrapped with Kyoto Yuzen fabric and then sealed with a clear food safe lacquer. Kyoto Yuzen is a traditional craftwork and was created by fan painter Miyazaki, Yuzensai during the Genroku period. Repeating color designs are created with the use of dyes and stencils. 9 inches long with blended ends and smooth tips. Made in Japan. 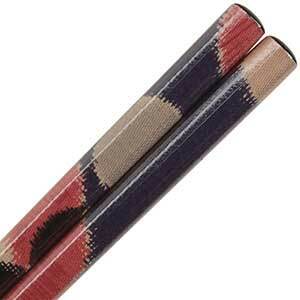 Kyo Yuzen fabric chopsticks, 1 pair. 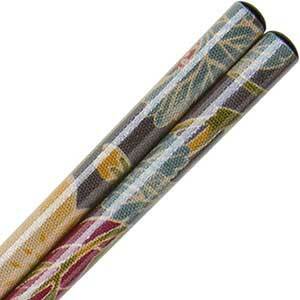 These chopsticks are wrapped with Kyoto Yuzen fabric and then sealed with a clear food safe lacquer. Kyoto Yuzen is a traditional craftwork and was created by fan painter Miyazaki, Yuzensai during the Genroku period. Repeating color designs are created with the use of dyes and stencils. 9 inches long with blended ends and smooth tips. Made in Japan. 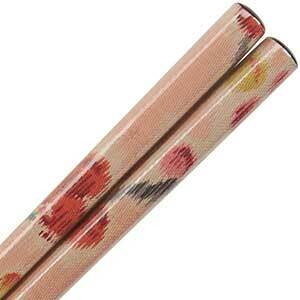 Kyo Yuzen fabric chopsticks, 1 pair. 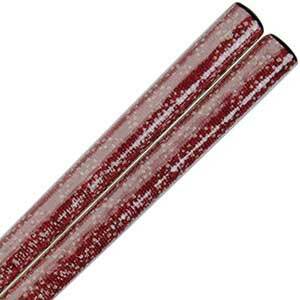 The fabric used in this chopstick is from the Kyoto region of Kamo. 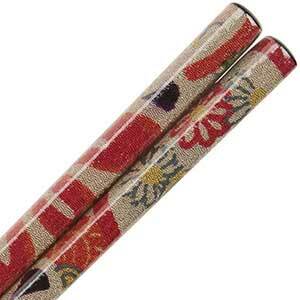 These chopsticks are wrapped with Kyoto Yuzen fabric and then sealed with a clear food safe lacquer. Kyoto Yuzen is a traditional craftwork and was created by fan painter Miyazaki, Yuzensai during the Genroku period. Repeating color designs are created with the use of dyes and stencils. Black chopsticks, 9 inches long with blended ends and smooth tips. Made in Japan.